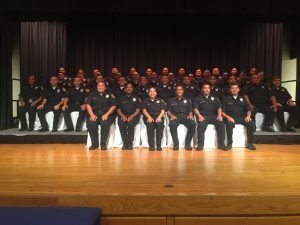 HONOLULU – The Department of Public Safety (PSD) today welcomed a new class of adult correctional officers at a graduation ceremony held at the Neal Blaisdell Center in Honolulu. Forty-two (42) recruits graduated from Basic Corrections Recruit Class (BCRC) 17-02 training and will begin their careers as correctional officers in facilities across the state. BCRC is a 9-week training that includes 360 hours of classroom time and physical training. Recruits learn standard of conduct, professionalism and ethics, report writing, interpersonal communications, maintaining security, crisis intervention, security threat groups (gangs), mental health, first aid, firearms, and self-defense tactics. All incoming classes receive Recruit Field Training along with Basic Corrections Training. That means, during the final weeks of training, they go into the facility and begin their job with the guidance of their training sergeants. There were five awards handed out at today’s graduation ceremony. The Academic Excellence, Top Gun, and Physical Fitness Awards are given to recruits who scored at the top of their class in these three areas of testing. The Inspirational Recruit Awardee is chosen by his or her recruit peers. The Distinguished Recruit Award is awarded by the training staff to a recruit who they feel exemplifies excellence in all phases of training.